The California state ranked #6 Santa Monica College Corsairs faced #15 Fullerton College Hornets in a decisive match to continue in Southern California regional playoffs. Santa Monica had recently secured themselves title holders of the Western State Conference Championship for its second consecutive season. 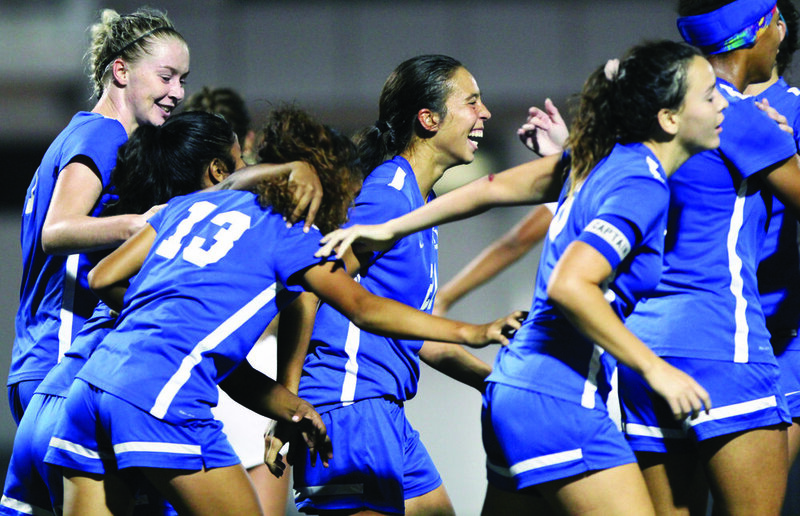 The Corsairs had high hopes of making it through round one of playoffs, where their season ended a year ago in a match against Orange Coast College. The first ten minutes of the match were heart stopping when the Corsairs suffered a goal with the clock marking 17 seconds. It was a wake up call for the team and they had to quickly step up and organize a group effort to make up for the disadvantaged. It was up to Santa Monica’s leading scorer No. 17 Filippa Struxsjo to control the assist pass by No. 6 Antoinette Saldana and tie the game in minute seven. With the confidence boost and cheers from supporters, the team immediately pushed forward. Two minutes later, Midfielder No. 4 Paullina Salas made a pass to No. 7 Ceirra Little, who picked up speed towards the goal and put the ball into the back of the net, giving SMC the lead by minute nine. After the intense first ten minutes, the match mostly balanced out as both teams were cautious and organized with their plays. The Corsairs had several good chances to score, but the third home goal was kept denied by the attentive Hornet defense. The scoreboard remained 2-1 through most of the game. When it was ten minutes before the final whistle, freshman No. 13 Daily Ramos was in the penalty area, ready to score the third goal of the night for the Corsairs, securing Santa Monica’s victory and ending Fullerton’s playoff run. The players in the bench immediately bursted into the field and the team celebrated. The Corsairs will now face No. 12 Santa Barbara City College, last year’s California Community College State Championship runner ups. The match is scheduled for Tuesday, November 20 at seven p.m. in Santa Barbara, California.